I now have a new favourite soup. It's no secret that I LOVE homemade blended soups.....it's a real favourite of mine, actually. Warm soup, cold day (snow on freaking EASTER)....perfect match. For holiday meals, I normally include some sort of orange vegetable - sweet potatoes, squash or what have you. But I wanted to change it up a little bit for this holiday. You see, my huge pet peeve with a turkey dinner is that it takes all day for the meal to cook and then the hordes inhale the food and it's gone in about 10 minutes. Ten minutes for dinner is a travesty on the best of days, but to have a holiday mealthat I (personally, as a non-religious person) centre around gatherings of people last a mere 10 minutes is just wrong. I decided to structure the dinner a bit more like a dinner party and less like a hoover-fest (in so doing, hoping to also alleviate some of the overly full feelings that I've come to associate with a turkey dinner....it kinda worked). Anyway, this soup was surprisingly incredible. Like really, one of the best soups I've ever made. I could almost go so far as to say it was the highlight of the meal. Of course, I couldn't find calvados or butternut squash, but the alterations I made the initial recipe (from Bon Appetit) were really good. I don't know if I even want to try it the original way because it was just that awesome. I made the soup the night before (including the evaporated milk) and just reheated it in my big crockpot to free up range-top real estate. It took about 3.5 hours on high to get to the right temperature. If you like soup, this is beyond incredible. SO flavourful and utterly worth having to hack through a giant hard buttercup squash (if hubs hadn't been home, I would have used a reciprocating saw - this is one solid gourd). 1. Preheat oven to 375°F. Line a large baking sheet with parchment paper (or a SILPAT). 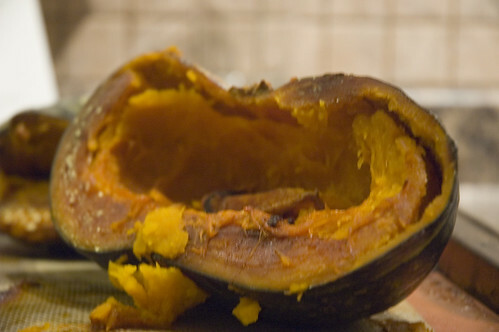 Scoop out seeds and brush squash flesh with 2 tablespoons oil. Place on prepared baking sheets, cut side down. Roast squash until very tender, about 1 hour. 3. Melt butter with remaining 2 tablespoons oil in heavy large pot over medium heat. Add onions, cinnamon sticks, bay leaves, salt, and pepper. Sauté until onions are soft, about 10 minutes. Add brandy and simmer until almost all of liquid evaporates, about 1 minute. Discard cinnamon stick pieces and bay leaves. 4. Add squash to onion mixture, along with chicken broth. 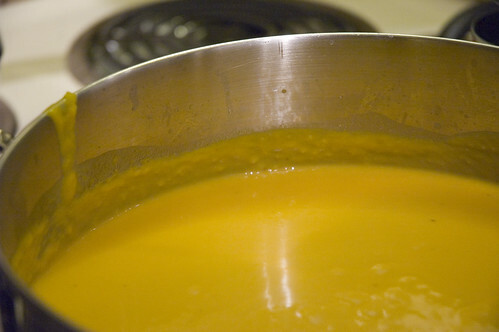 Puree soup with an immersion blender (or use a blender or food processor). The initial recipe called for straining, but I didn't do that. Add in the can of evaporated milk. If the soup is too thick, you can add more broth. My soup was quite thick, but I like it that way. (at this point, I refrigerated my soup and reheated the next day in the crockpot for three and a half hours on high). 5. Mix sour cream, ground cinnamon and dash ofcumin in medium bowl to blend. Bring soup to simmer. Ladle soup into bowls. Garnish each with dollop of cinnamon cream and serve. Honestly, I didn't think this soup would be bad, but I had NO idea it would be as awesome as it was. It's seriously really really REALLY good. 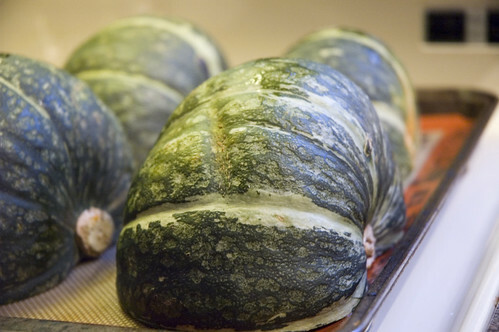 The buttercup squash is superlative and just has the most amazing flavour. Make this - it would be a great meal along with a salad and baguette. It would also be easy to make vegetarian just by using veg. broth. This sounds wonderful and I plan to try it soon. I completely concur about the whirlwind meals. It is like lining up hogs at a trough - 10 minutes later they are all asleep in their chairs - HA! I love soup! So can you freeze this recipe? I find anything with starchy veggies in it hard to freeze and keep the same consistency. Yum! 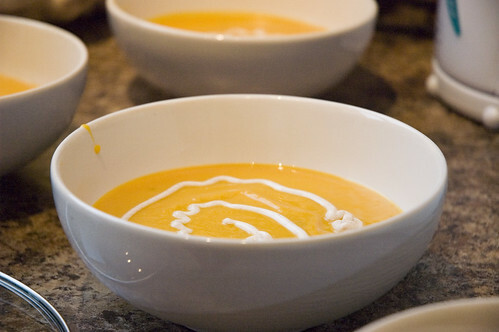 I've had similar soups before - this sounds like a nice easy recipe that tastes fantastic. Thanks! What a great combination of flavours! That sounds delicious! anonymous - you are COMPLETELY right. I forgot to write in the brandy! There's supposed to be a 1/2 cup in there. Mmmmmmmmmmmmmmmmmm. I'll go fix that now! thanks for noticing. mk99 - it's good. You should definitely try it. On the scale of pureed soups, this is a total winner. brilynn - it really is good. SOOOOOOOOOOO rich and decadent. Yum. This looks so good and since you said it was reallly realy really good, I'm trying it. I like the cook before and reheat in crock idea. I'm thinking Thanksgiving. Do you think pumpkin would work with such devine results? I heart pumpkin!